The Ruby Floret Earrings include a central cluster of rubies arranged in a flower design with an outer ring of brilliant and baguette diamonds. 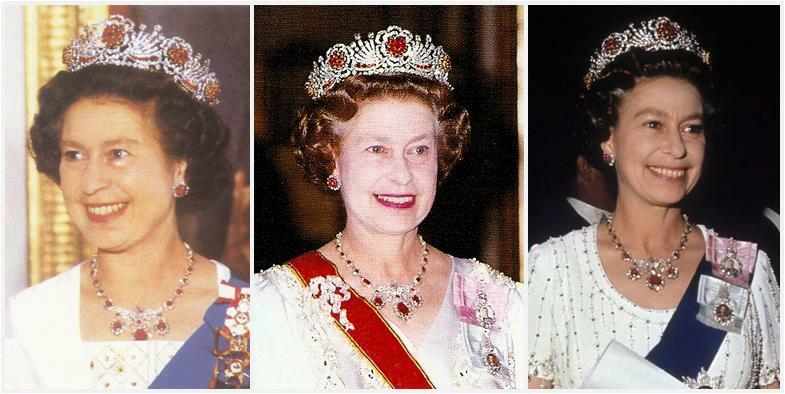 According to Leslie Field's The Queen's Jewels, they were made from stones from the Queen's private collection; Field groups them with the Burmese Ruby Tiara, also a commission from existing stones including the diamonds from the Nizam of Hyderabad Tiara and a collection of rubies given to the Queen as a wedding present by the people of Burma, made in 1973. Indeed, these were matched on several occasions with the Burmese Ruby Tiara. 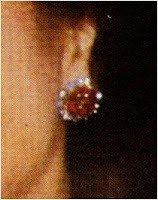 But they are not as popular or as well-known as Queen Mary's Ruby Cluster Earrings, which are a similar size, and were primarily used by The Queen in the 1970s and 1980s. And now, apparently, The Queen has passed them on to be used by another. In 2015, the Ruby Floret Earrings appeared on The Countess of Wessex for the first time in public. They were spotted by Anna from the Countess of Wessex Blog, where you can read more about the appearance and see more photos.